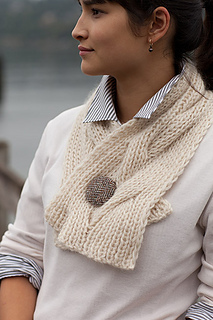 One big, luscious, lofty cable, in a reversible rib so it’s just as gorgeous on both sides. Wrap the shorter version various ways with a pin or a big button. We sewed two tweedy buttons together back-to-back for a jumbo ‘cuff link’ and buttoned them through the holes created by the cable twist. You can share the long, handsome muffler with a man if you like. 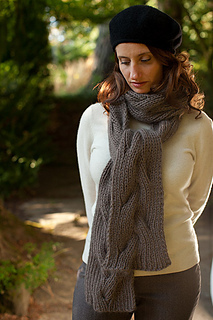 The yarn is held double throughout, so the pattern knits up in a hurry for a last minute gift or quick winter warmth. Neck wrap: Approx. 7 x 30” / 18 x 76cm. Scarf: Approx. 7 x 80” / 18 x 203 cm. Neck wrap: 2 skeins Rowan Kid Classic (153 yds / 140m each), Color 828. Or approx. 300 yds / 274m of an equivalent worsted-weight yarn held double throughout. Scarf: skeins Rowan Kid Classic (153 yds / 140m each), Color 866. Or approx. 900 yds / 823m of an equivalent worsted-weight yarn held double throughout. US 13 (9mm), or size to obtain gauge. Approx. 18 sts = 4” / 10cm in K1⁄P1 ribbing, not stretched, yarn held double. Photo Notes: Nora wears a Churchmouse Classics Ribbed Pencil Skirt in addition to the neck wrap. 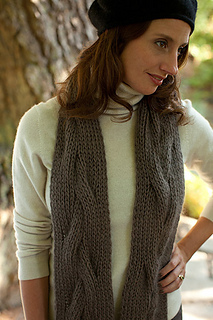 Shown in 32” length, knit in Simply Shetland Lambswool and Cashmere, Color 190.